With all the chilly weather we have been having, we thought we would take a moment to highlight one of our favorite plants that is so aptly named for this season: the Ice Plant! Here at Hutcheson Horticultural, we sell the ice plant, also known by its scientific name, delosperma. Let us find out a bit more about it! What makes this plant so special? How big will this plant get? 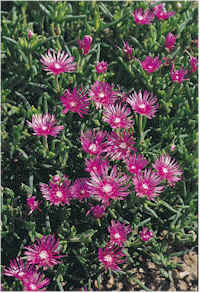 The ice plant is a spreading plant that is FANTASTIC as a ground cover. Upon reaching full maturation, it will be about 12” to 36” tall, and is a perfect addition to any garden! Make sure you do not plant it where fragile flowers are though, as it will steal some of their nutrients. This plant will also double its width and size every two years, making a great perennial ground cover. The ice plant is not only a fantastic ground cover, but also produces a beautiful and delicate lace-like purple flower with a yellow center. The fact that it blooms makes it beautiful on its own or as a filler plant! Does this sound like it would be perfect in your garden? If so, let us know! We sell them at Hutcheson Horticultural and would love to speak with you further about adding it to your home garden!